Isn’t your screen shot from the Independent actually a 3rd party advert? Either way, I have become not just immune but actually allergic to click bait, and refuse to click. 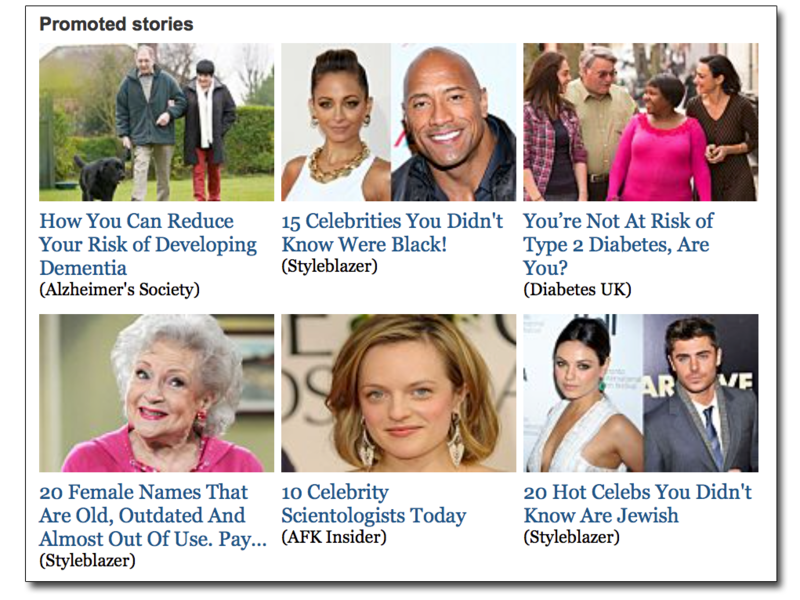 It’s a bit surreal for me to be defending click bait, but I did want to note that the advert for “20 hot celebrities you didn’t know were Jewish” is likely targeted to Jews rather than suggesting that their being hot prevents people from knowing that they are Jewish. (If I haven’t mentioned that I’m Jewish, now seems like an appropriate time to do so.) It’s a very common activity for Jews to discuss who’s Jewish, and my impression is that it’s done to foster a sense of community and the idea that one’s being Jewish connects them to people you read about. My experience has been that this conversation topic is at best awkward for non-Jews, who are generally surprised that Jews do this. “Secrets of how mad scientist thwarts global advertising conspiracy”.